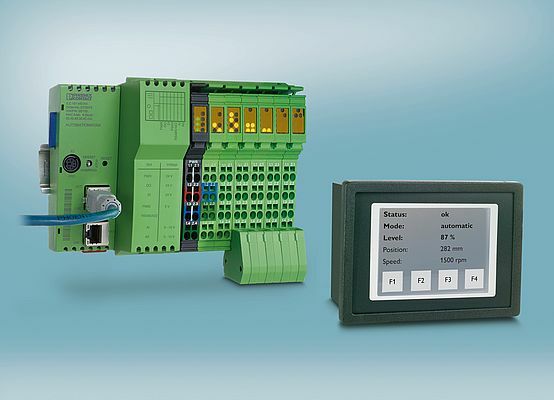 Phoenix Contact expands the Easy Automation system to include ILC ME mini controllers, designed specifically for mechanical engineering, and the compact, TD 1030T HMI devicefrom the Minitouch line. The ILC 191 ME/AN and ILC 191 ME/INC mini controllers feature Ethernet, RS232, and RS485/422 ports as well as connections for pulse/frequency outputs. They also offer analog and digital inputs and outputs, high-speed meters, and incremental encoder inputs. This makes them particularly well suited for activating drives by way of step motor drivers or frequency converters. The TD 1030T HMI device features a 2.8-inch multiline screen used to display data in alphanumeric format. Users interact with the device using four freely configurable buttons on the display, with PC Worx Express used to program the device. Because several standard, predefined user interfaces are available, no visualization software is required.